If you do not belong to a church, and especially if your spiritual path is unconventional, you do not always know where to turn when you need the support or services of an ordained priest or minister for the important passages in your life. I would be pleased and honored to provide you with that pastoral care and support. I am an Independent Anglican priest, and a published author and poet. I am deeply influenced by the Christian Inner Tradition, also known as the Perennial Philosophy. I celebrate marriages for all committed couples, baptisms and naming ceremonies, funerals, memorial services, companion animal blessings, and home blessings and clearings. I have offered my expertise as a pastoral counselor and spiritual director for over 35 years. 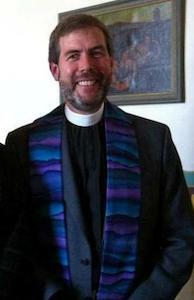 I was born and raised a rather conventional New England Congregationalist, but was spiritually and politically radicalized during seminary in the early 1980s, when the path to ministry was closed to me because of my sexual identity. I walked away from mainline denominational Christianity. Since then I’ve followed a path of ministry in the margins, finding and creating faith community in unconventional ways among good people who have been cast off or rejected by the mainstream churches. As a Independent Sacramental bishop I provide pastoral and episcopal oversight to clergy and communities who seek it. Like most Independent Sacramental clergy, I am a worker priest: I support my local ministry by earning my living as a Realtor® after retiring from a career as a business consultant. I live in Sonoma, Ca., with my husband David.